Touched my heart even more today. Comforting... in a way. 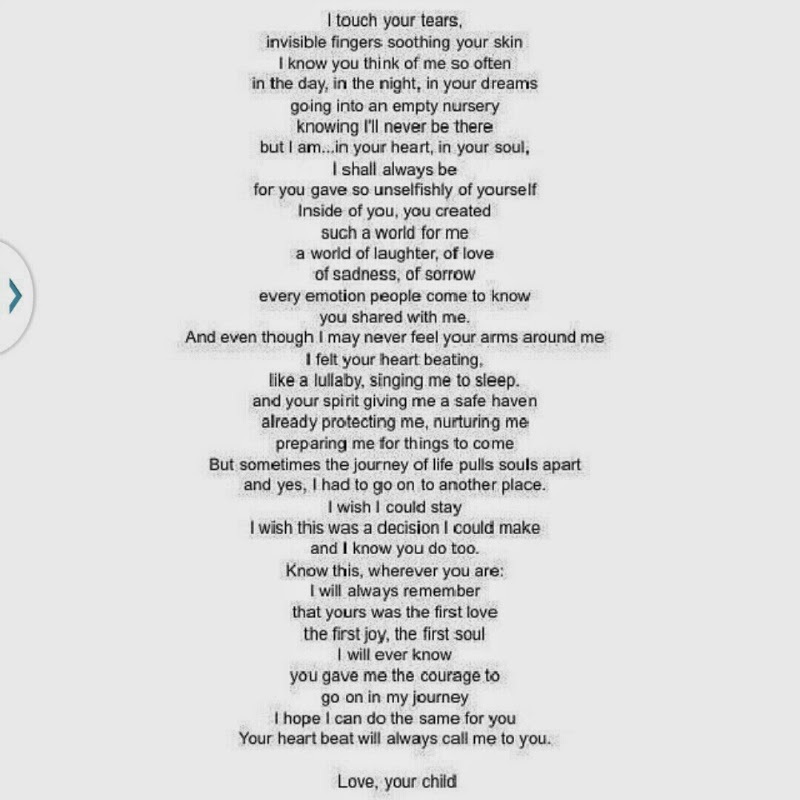 A picture of a poem I got from an IG account of another mother to a child in heaven (@angelmommies). This date last year was Putri Jibrael Zumirrah's EDD (estimated due date) according to the doctors... 12/13 April 2013 was the date my daughter was supposed to leave my body, according to them. The date I was supposed to give birth to her. I remember I met three different doctors. First from a clinic near my office, second and third from 2 different private hospitals. They said the same thing. But fate decided that she came into this world on 14th January 2013. :) That beautiful day. I get to meet her and hold her earlier than expected. Today, she's 1 year and 3 months if she's still around. I would have been able to see her crawl, laugh, call me Mama, walk and... I don't know just all those milestones that I can just imagine? I'm getting better at handling this day today compared to last year I suppose but it's still so difficult. Still so painful. Its something I never expected I would have to face. A pain I never thought possible. Physically and emotionally. What more with @kneok leaving for work outstation this morning. One after another. Today is a day I decided that I have to take care of my health and not push myself too hard. There are times that we are just weak and today is that kind of day for me. I am sure there are others who have lost someone dear to them who would understand what I am saying. My husband reminded me that yes Jibrael's EDD was today but she was born on 14th January 2013 and she lived on that day. A lot of babies are born before their EDD but the EDD still hold a lot of significance to me. Estimated. Expected.... Expect the Unexpected. God knows best. God is the best of planners. We all get what we deserve and I am undeserving of a lot of things. But, God gave me Jibrael. A love I never thought possible it lingers every second since even before I carried her and it gets even stronger when I carried her, gave birth to her, met her, held her and even more... when she left this world to go to heaven... I miss Jibrael. I miss what we went through together and I miss the things that I do not get to do with her till today. I miss the things that I am not able to see her do. To grow up, like the rest of us. I want to see that. See her grow up just like other mothers see their children grow. I cannot wait to see her again. But, i try my best to be patient. She has served her purpose in this world, I haven't. I am blessed to have her waiting for me in heaven. I imagine heaven with Jibrael in it eventhough the beauty is unimaginable and that makes me smile. I want to go there too but I know I am still undeserving of it. I want to be strong and inspiring, like my daughter.... but I can only try. We can only plan but He is the Ultimate Planner who determines everything. Life and death, all predetermined. We all belong to Him and will all return to Him. Alfatihah tak putus, Jibrael ku sayang. Today was very difficult (unexpectedly) but I had emotional support from both my soulsister Ruzana Ibrahim and sister-in-law Syahira Zakaria in my room. Thank you ladies for the support. Unexpected and I am truly blessed. She was a gift from God . Beautiful, ethereal, glorious. Allah has reclaimed His gift to us. She was too precious for us to enjoy in this world. Hopefully we are worthy of her company in the next. Of course it is painful beyond respite. Death is the ultimate test. But, dont forget that we are also gifts of Allah to others in this world too. Continue being that gift. When Allah takes us away from this world, will we be as worthy a gift to others as our daughter was to us?